Bayou Billy consists of three distinct playing styles used over 9 levels: shooting (optionally allowing the use of a Zapper), a side-scrolling beat 'em up, and a third-person driving section. Unfortunately, all three modes (especially the side-scroller) were not well executed, and the game remained unpopular among gamers, despite Konami's record of hit titles on the NES. 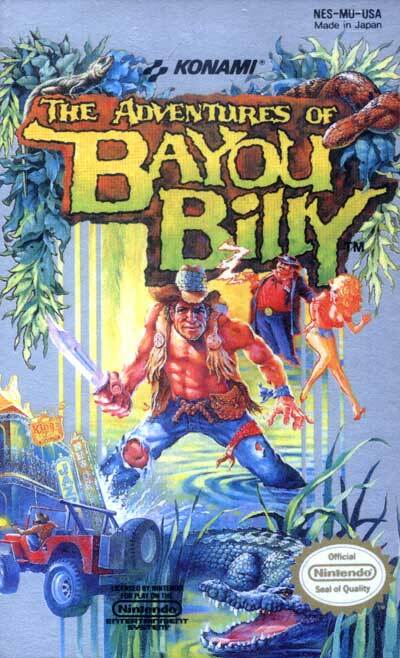 During its release, Konami hyped the game, including a commercial with a live actor playing Bayou Billy, and went as far to sign a deal with Archie Comics. Part of the game's unpopularity was due to a rather high difficulty level, making the game very hard to beat. Strangely, the Japanese release featured a much better balanced difficulty.